Author/Illustrator Matthew Holm: Babymouse: Königin der Welt! 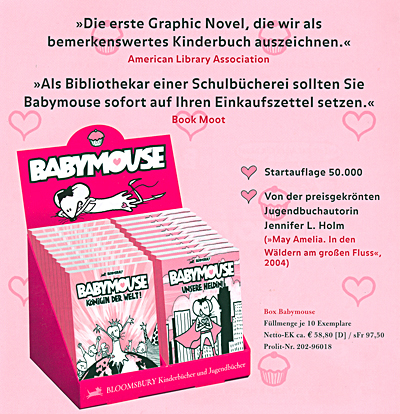 Ja, Babymouse has made the leap to Germany, as well! Each Babymouse story is like an enormous chocolate box, in which, aside from the chocolates, are also found film clips and literature quotations. Great fun—without any toothache! The German versions of Babymouse: Queen of the World (Babymouse: Königin der Welt!) 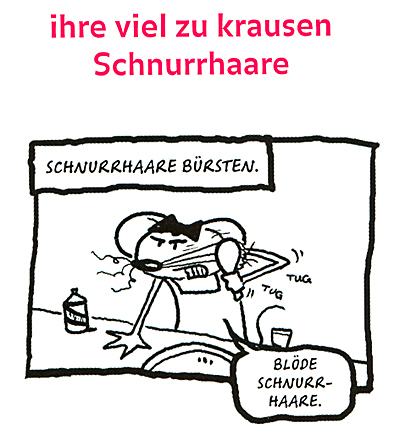 and Babymouse: Our Hero (Babymouse: Unsere Heldin) are available via Amazon.de. LATE ADDITION (9/19/07): I was just checking up on the German Amazon page (I couldn't remember if the book was out yet, or not) and did a quick Babelfish translation. Apparently, Babelfish thinks that my name translates as "Matthew cross-beam."